The summer season is coming to it’s end and Fall is on the horizon. In Traditional Chinese Medicine theory each season is linked with a natural element, organ and emotion. The Fall season is ruled by metal, lung and grief. Acupuncturists are always going on about wearing scarves. But it’s for good reason that scarfs are encouraged. Pathogenic factors such as cold and wind invade the body at the back of the neck. 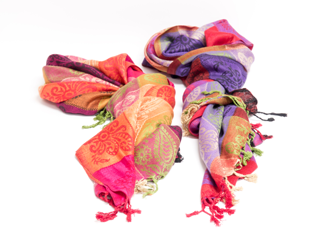 Scarfs help to keep that vulnerable area protected. This can be very important in the fall. Even if it’s sunny or seems a bit warm, always bring a scarf when you head outside in the Fall. Fall is primarily the time to strengthen the Lungs in preparation for Winter. Rebuilding heart and kidney energy is also important because their energy gets depleted over the course of the Summer. Usually when there is the hottest weather – the hottest summer – is when the challenges are the greatest to the heart and kidneys. This means that if there has been very hot weather over the summer, then to that extent your heart and kidney energy has been depleted and need to be replenished. This certainly applies to Arizona, doesn’t it? Every summer here is a very hot summer! In addition to these key organs, the digestive system also needs support as the season transitions into Fall. Seasonal acupuncture treatments just four times a year serve to strengthen the inner organ systems and correct minor annoyances before they become serious problems. Fall is time to refocus. Fall is a time when we need to refocus on our goals and our business. Fall is the time to get clarity about what is important in one’s life. Once that is done then taking on the tasks and priorities that support these goals is the next task. Fall heightens our innate ability to get stuff done. Take advantage of the Fall season by reminding yourself where to focus. From an acupuncture perspective, Fall is about refinement. It’s time to pare down, to let go of the excesses we allowed ourselves in Summer and focus on what’s necessary for Winter. Step away from the salad. The cool, raw, refreshing salads of summer will not do your body any favors come Fall. Just as we need to start keeping our bodies warmer on the outside, we need to stay warm on the inside as well. As far as vegetables, root vegetables such as beets, turnips, carrots, parsnips, sweet potatoes, pumpkin and squash are ideal. If you go for out-of-season vegetables, make sure they are cooked. If you’re craving fruit, reach for something seasonal such as apples, pears, grapes, figs or persimmons. Dryness of all kinds is common in Fall. Since Lung is the most exterior organ, it is the organ that relates most closely to the skin. Dry skin and sometimes rashes tend to show up in Fall. Drink a lot of water and keep your skin hydrated with non-alcoholic moisturizer. Don’t use a moisturizer with alcohol as an ingredient as it will dry you out more. Another reason to stay hydrated is to regulate digestion. The Lung’s paired organ is the Large Intestine. This means that sometimes digestive issues can flare up during the Fall season of the year. Because the Fall season is very dry constipation can be a common complaint for many people at this time of year. This can be especially true for people who struggle with the “letting go” aspect of transitioning into fall. As Fall encourages us to let go of the non-essential priorities in our lives, many of us also find ourselves letting go from our nasal passages. Keep a good supply of tissues on hand. Fall is the most common time of year for the onset of nasal infections and post-nasal drip, both of which plague many people well into winter. Keep a neti pot in the shower and use it regularly throughout the season to help keep your nasal passages clear. And again, remember seasonal acupuncture treatments even just four times a year serve to strengthen the inner organ systems and correct minor annoyances before they become serious problems.